I’m a guitar teacher, singer and Songwriter born in São Paulo Brazil, son of the well known Rio de Janeiro fotographer Sascha Harnisch. For family reasons I grew up with three mother languages, Portuguese, English and German. My Austrian stepfather born in Vienna (Austria), a connoisseur of the Jazz Music, brought me to Big Bands, Vocal Groups and last but not least to Django Reinhardt the “Godfather” of modern jazz guitar. After moving from Brazil to Germany, I first attended an English High School in Hamburg. A schoolmate one day played "She loves you" from The Beatles and from that day on my musical life changed completely. I bought an electrical guitar and rehearsed all the solos played by the "The Fab Four" until my fingers bled. 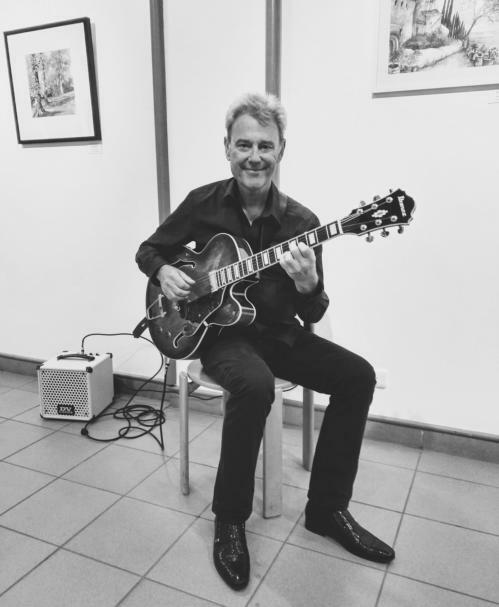 I played then in innumerable jazz- rock and cover bands until the day where I discovered my love for songwriting. 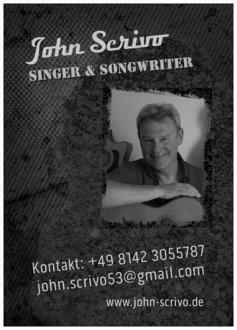 That is more or less how my artist name John Scrivo was created. A mixture of John (Lennon) and Scrivo (”io scrivo” = I write in Italian). Some friends call me John and some Alex.